I know, I know, the last time I posted about Black Forest Cake, I complained about the plethora of bastardized chocolate-cherry recipes masquerading under the "Black Forest" name. 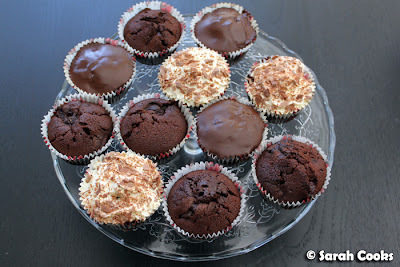 So why would I be adding to the canon with my own Black Forest cupcakes? Well, you can't deny that chocolate and cherries are a match made in heaven. 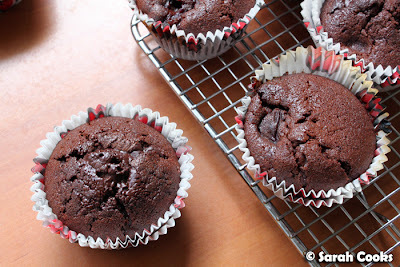 The other day I had a craving for chocolate muffins, and happened to have some pitted cherries in the freezer. 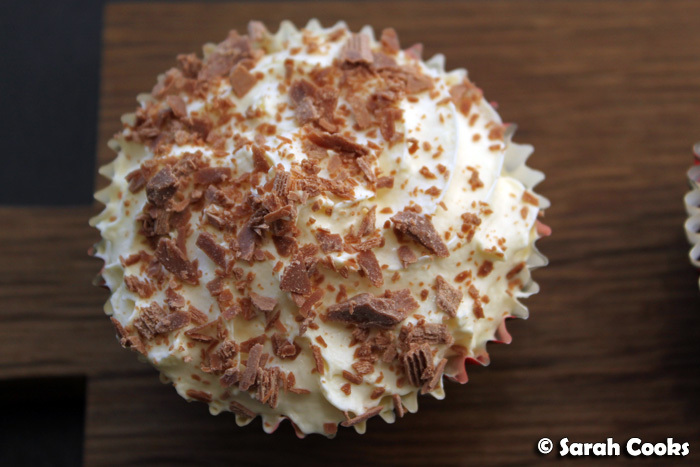 From there, it was just a hop, skip and a jump to Black Forest cupcakes! And having previously established my bona fides as a maker of authentic Schwarzwälder Kirschtorte, I felt I should be allowed a little creative leeway. 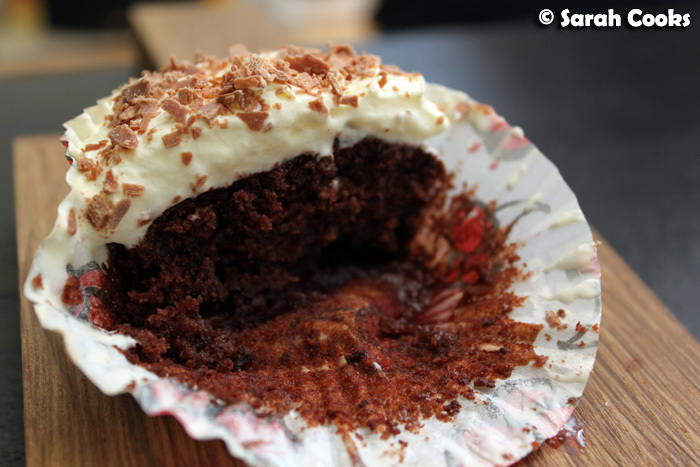 I based the recipe on Nigella's Old Fashioned Chocolate Cake (Feast) - you may remember that I never really liked this recipe as a full-sized cake, but had wild success with it as cupcakes. I added extra chocolate pieces (a 100gm chocolate bar, whizzed to a medium rubble in a processor), frozen pitted cherries, and a good splash of Kirsch to transform them into Black Forest cupcakes. I also love the fact that the batter is made easily in the processor. You'll see I chopped the chocolate but left the frozen cherries whole; in retrospect I should have chopped them up too, as they were quite large and the batter couldn't get around them evenly, leaving some little dents and holes in the finished product. 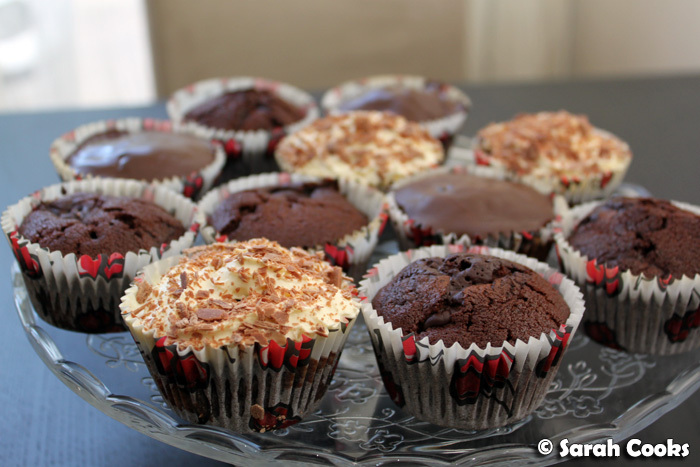 But not to worry, they tasted good nonetheless! ... and for the rest I painted them with cherry jam, piped whipped cream on the top and sprinkled chocolate flakes over. Ta-dah! Mmm... yum yum! They were a perfect little treat: moist and tender crumbed, with an intense, grown-up taste from the lovely dark chocolate, bitter cocoa and kirsch. These were a lot easier to make than a full Schwarzwälder Kirschtorte, but still delicious. 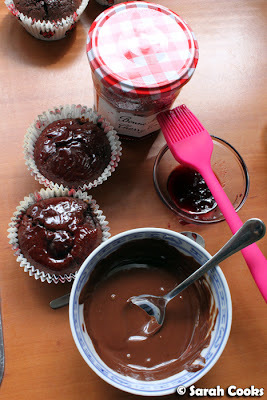 I think I know what I'll be baking when I want a quick chocolate-cherry fix! Preheat the oven to 180C, and line a 12-cup muffin tin with muffin papers. 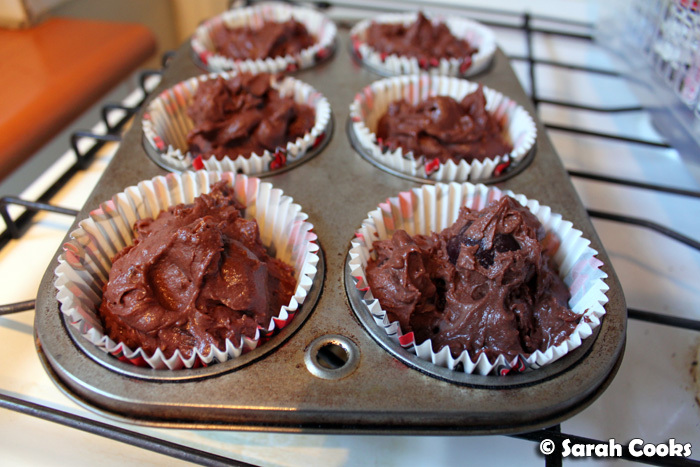 Place the dark chocolate in a food processor, and whizz to form small pieces. Set aside. If the cherries are quite large, pulse them briefly in the processor. Set aside. 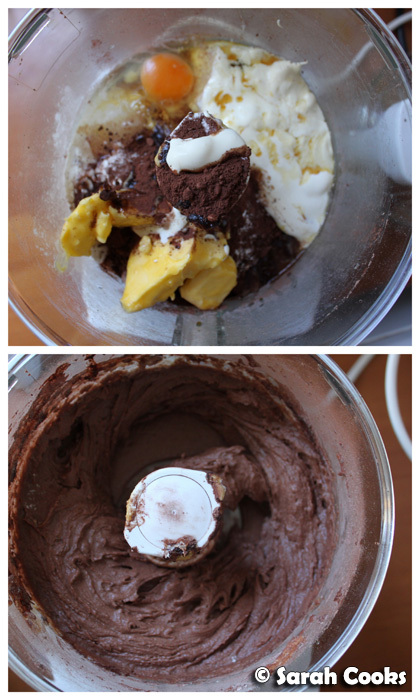 Place all the remaining ingredients (except those for decoration) in the processor, and mix until you have a smooth batter. 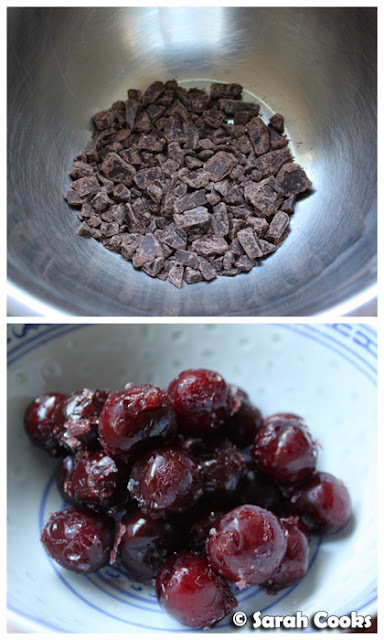 In a large bowl, mix the chocolate pieces, cherry pieces and chocolate batter together. Scoop the batter into the prepared muffin tin, and bake in the preheated oven for 20 minutes or until cooked when tested with a skewer. Leave to cool completely, and if desired, decorate with cherry jam and melted chocolate, whipped cream and chocolate flakes, or any combination that you like. Thanks so much! I suppose that's the danger of a dessert becoming super popular - other examples I can think of: macarons, tiramisu, cupcakes etc. - it becomes harder to find a quality version! And yes, you absolutely must make your own, sooooo yum! Oh you are very very naughty. I wonder if the Haupttortenprüferin approved?